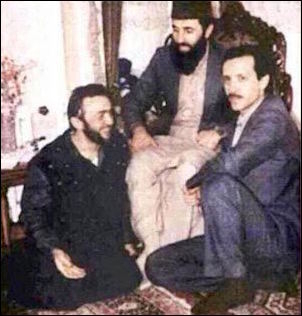 Turkish president Recep Tayyip Erdoğan (right) and Tunisian Islamist Rachid Ghannouchi at the feet of Afghani warlord Gulbuddin Hekmatyar in the 1990s. In many ways, the recent crisis between Qatar and its Gulf and other Muslim "friends" marked, among other things, the last nail in the coffin of Turkey's "grand Middle Eastern design." Once again, Turkey's leaders were trapped by their own ideological shallowness into betting on a losing horse. Very important Turks in dark suits saw the start of the Arab Spring as a golden opportunity to realize their neo-Ottoman ambitions. In Tunisia, their Islamist brothers in arms, the Ennahdha Party, would come to power and annihilate the "secular infidels." Rachid Ghannouchi, Ennahdha's chief ideologue, never hid his admiration for Turkish president Recep Tayyip Erdoğan's stealth Islamization by popular vote. Erdoğan received one rock-star welcome after another on his visits to Beirut and Egypt. He failed, however, to detect that Lebanese Muslims' devotion to him was merely praise for his outspoken hatred of Israel. He also failed to predict the turn of political events in Egypt, investing all his political resources in the Muslim Brotherhood. In Iraq, he calculated that with some western backing, he could end the Shiite rule in Baghdad and build a Sunni regime instead. In Gaza, Hamas was, and still is, Erdoğan's ideological next of kin. Qatar is Erdoğan's main ideological partner in the region. In Syria, the non-Sunni [Alawi] president, Bashar al-Assad, is Erdoğan's worst regional nemesis. Erdoğan's expectation, it appears, was that Assad would be toppled and replaced by a coalition of Sunni jihadists. Eventually, a pro-Sunni belt in the Middle East would take shape, totally subservient to the emerging Turkish empire and to its emerging caliph, Erdoğan. Such was Erdoğan's grand design for the region. Qatar was not simply the "lubricant" of Turkey's fragile economy but also Erdoğan's main ideological partner. The story is not progressing according to that script, however. Hezbollah in Lebanon decided Erdoğan was simply "too Sunni" for their tastes, notwithstanding his virulent anti-Israeli rhetoric and ideology. In Tunisia, Ennahdha, to Erdoğan's disappointment, signed a historic compromise with the country's secular bloc instead of fighting to annihilate it. The Brotherhood in Egypt lost not only power but also legitimacy as international pressure mounted in recognition of the group's links with violence. In Baghdad, the rulers are still Shiite and controlled by Tehran. In Syria, Assad remains in power, backed by Iran and Russia, and Erdoğan's jihadist comrades are almost entirely devoid of strategic importance. Moreover, an emerging Kurdish belt in northern Syria has become a Turkish nightmare. Hamas, like the Brotherhood, is getting squeezed day by day, both regionally and internationally. Erdoğan's ambition to end the naval blockade of Gaza is already a long-forgotten promise. And now Qatar is in trouble, along with Erdoğan himself. It is not just Erdoğan's other friends in the Gulf and the Muslim world that are now strangling Qatar through a punishing isolation. Erdoğan must also contend with US President Donald Trump, who declared that Qatar – Turkey's staunchest ally – "had been a high-level sponsor of terrorism." Erdoğan, still a firm believer in ideology as foreign policy, is not getting any closer to reality. Immediately after the Gulf and other Muslim sanctions were placed on Qatar, the Turkish president signed two treaties with the Gulf state: one to send troops to a joint Turkish-Qatari military base in Qatar, and the other to provide Turkish training for Qatari gendarmerie units. Turkey, along with Iran, also quickly moved to send food stocks to Qatar in an attempt to ease the sanctions. Erdoğan said the sanctions were wrong; that Ankara would continue to improve its already good relations with Doha; and that "we will never abandon our Qatari brothers." With a caliph's self-confidence, he ordered that the crisis be resolved before the end of the holy Muslim month of Ramadan (i.e., the end of June). As to Qatar's connection to terror, what connection? Erdoğan says he has never seen Qatar supporting terrorism. This declaration is reminiscent of his past statement that he "went to Sudan and did not see any genocide there," made in support of his "good friend" Omar Bashir, who was wanted by the International Criminal Court on charges of crimes against humanity and genocide. The cast of the Gulf drama reveals ideological kinships. As part of their anti-Qatar campaign, Saudi Arabia, Bahrain, the United Arab Emirates, and Egypt accused 59 individuals and 12 charity organizations of terror links. 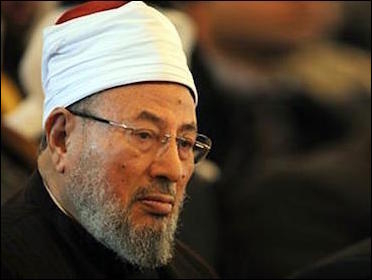 One of the accused is Youssef al-Qaradawi, the Egyptian chairman of the International Union of Muslim Scholars. Who is Qaradawi? In 2004, Qaradawi said, "There is no dialogue between us [Jews and Muslims] except by the sword and the rifle." In 2005, he issued a fatwa permitting the killing of Jewish fetuses. And in 2013, when millions of secular Turks took to the streets to protest Erdoğan's Islamist policies, Qaradawi rushed to Erdoğan's aid by declaring that the "Turkish protesters were acting against Allah's will." Once again, Erdoğan's Turkey stands on the wrong corner at the wrong moment. Some of his men fear Turkey may be next in line for international sanctions for standing in solidarity with what Washington views as a high-level sponsor of terror. This may be unlikely, but Erdoğan is ignoring two potential dangers. First, he is operating on the flawed assumption that business as usual will resume no matter how the Gulf crisis ends, and that the Turkish-Qatari alliance will be up and running according to the same ideals. Second, he believes the West is too weak to sanction Turkey either politically or economically, so it has little to fear on that front. A less Turkey-friendly Qatar may well emerge from the Gulf crisis. He is wrong on both counts. Doha may not be the same place after the Gulf Arabs find a way out of their crisis. A less Turkey-friendly Qatar may well emerge. Turkey's two staunchest ideological allies, the Brotherhood and Hamas, will likely be further pruned in their own corners of the Arab world, with non-Arab Turkey possibly remaining their only vocal supporter. And the impending "slap" Ankara is ignoring may come not from Washington but from Erdoğan's Muslim friends in the Gulf. Shortly before the Qatar campaign, Turkey's defense bureaucracy was curious as to why the Saudis kept delaying a ceremony for a $2 billion contract for the sale of four Turkish frigates to the Kingdom in what would have become Turkey's largest-ever single defense industry export. Now they have an idea why. That deal, if scrapped, may be just one of the starters on a rich menu.